Lance Nelson wants to be one of the first in the world to put a $1000 deposit on a Tesla Model 3, a car he hasn't even laid eyes on yet. Here's why. With the reveal of the $35,000 Tesla Model 3 right around the corner, a lot of people are understandably excited. But some Tesla fans are taking it to the extreme, lining up outside their local Tesla stores a day in advance, just to put down a $1000 reservation on a car that won't hit the streets until next year. What makes a person camp out on the sidewalk to reserve a car he or she hasn't even seen yet? 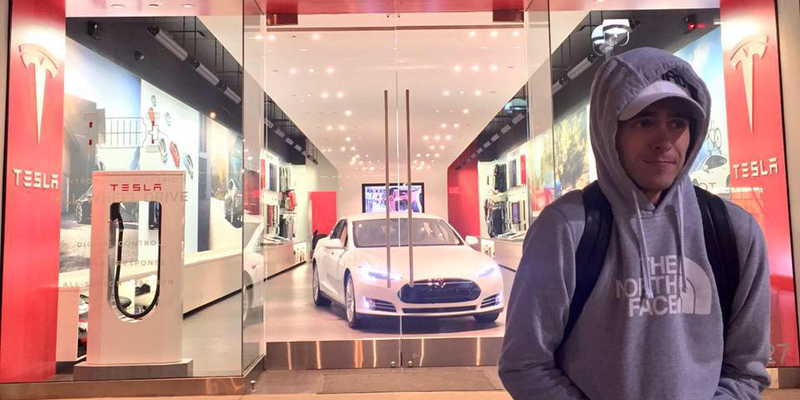 We caught up with the guy who's first in line at the Tesla store in Santa Monica to find out.His name is Lance Nelson, but on the Internet, he goes by Lance the Driver. He's a self-described social media influencer who's turned a passion for cars into a huge following: His Instagram account, for example, has nearly 60,000 followers. Lance and I met at a new car debut about a year ago, and when I saw him tweet about camping out 43 hours before ordering began, I knew I had to talk to him.Considering that automakers occasionally pay him to promote their vehicles on social media, you might assume Lance is camping out as part of a stunt coordinated by Tesla. But when I spoke to him via Facebook chat halfway through his sidewalk sit-in, he insisted he was sincere about reserving a Model 3. "I haven't had a car in roughly 2 years," he said. "It's time to have a daily driver." That previous car was a 2012 Ford Mustang GT California Special, quite a different car from the electric sedan he's waiting in line for. What is it about the Model 3 that makes it worth sleeping outside for two days to put down $1000 on a reservation that won't be filled until 2017—on a car that neither he nor anybody else has actually seen yet? I love the auto industry, and I think the fact that a new company can come in and completely shake it up while challenging others to be more environmentally friendly is great. I want to be part of a brand and not just have a car. Tesla is a very unique brand. It has something special and has made electric cars cool. I still love companies like Honda, Ford, and Toyota. I've just never had an electric car, and I'm ready to try something completely different than I'm used to. That doesn't mean he's a one-marque superfan, though. "I'm a Mustang guy. I'm a Tacoma guy. I have a lot of favorite cars. I just want to see what being a part of Tesla is like. Especially in such a big game changer of a time that the Model 3 will create," he said. He's also not worried about putting money down on what could potentially be little more than a smaller Model S.
"If it's a mini-S, which I know it won't be, I'd still be excited. It also goes with my whole vegetarian lifestyle. I want to get as clean with my impact as possible, and if that also means I have a fun electric car, then awesome." When I asked him what his ideal Model 3 would look like, he said, "You're going to laugh." He described how he'd personalize his Model 3, saying "as long as it's sporty looking, I want it to be wrapped in chrome with black wheels and red brake covers. I saw the same scheme on the Model S in San Francisco and was in love. Looked like something from the future." Really? A Model 3 completely wrapped in chrome? "Yeah," he said. "I want it to look something an X-Man would drive. Not for everyone but exactly for me." Considering he's planning to shell out for a chrome wrap, I had to ask him about price. Would he stick to the base model or spring for something fancier? "Right now, if there car was being delivered tomorrow, I would stick with the $35,000 [base model], but since it's almost 2 years away I'll have plenty of time to save toward a higher end trim," he said. Lance says he's budgeting about $45,000 to spend on the car—and that upgrade money isn't for luxury options like Autopilot. His main priority is speed. And once he has the most powerful chrome Model 3 he can afford, Nelson has big plans for it—driving all over the country working with anti-bullying charities. I was bullied growing up. That's what started "LanceTheDriver." Cars were what gave me something to focus on rather than what kids were saying or doing to me. I think that the majority of people that follow me connect with that. The idea that if you have a passion, you can get through any struggles and be stronger because of it. Being bullied was the worst experience, but I would never erase that because it made me who I am today. As cheesy as that sounds. When he finally gets his car, Nelson says his first trip is going to be a cross-country drive from Los Angeles to New York City. Clearly he's got big plans for his Model 3. All that stands between Lance and his brand-new Tesla is another night sleeping on a bench.